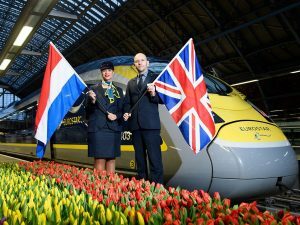 Eurostar is to start a third daily direct service from London to Rotterdam and Amsterdam on 11 June, 2019. The existing two services a day have been selling well since they were introduced through the Channel Tunnel on 4 April, 2018. 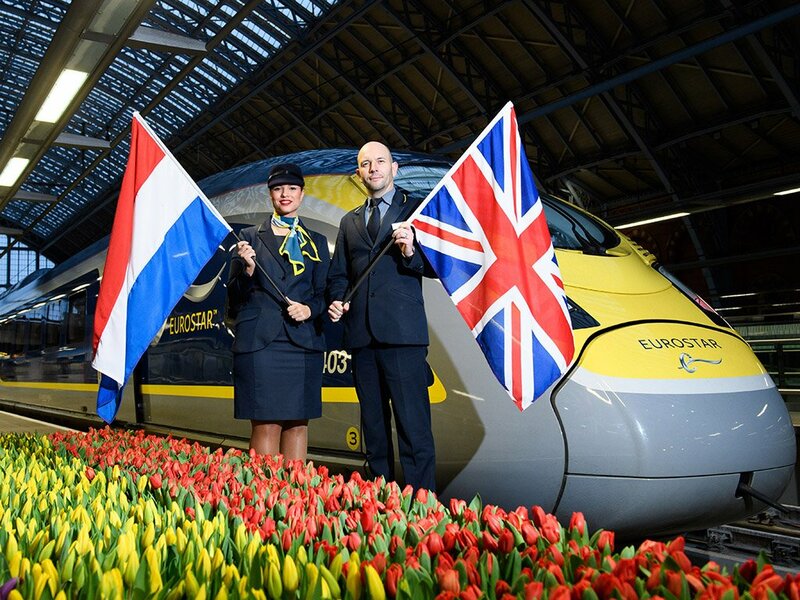 Fares on the high-speed rail service will continue to start at £35 one way, with journey times from 3hrs 13mins from St Pancras station in central London direct to Rotterdam and 3hrs 52mins to Amsterdam. Eurostar says a London-Amsterdam Eurostar journey emits 80% less carbon than the equivalent flight. The third service will bring Eurostar’s capacity on the route to the equivalent of 12 flights a day. The additional service will leave London St Pancras at 11.04 am, while the departure of the first daily train is advanced by 75 minutes to 7.16am, giving business travellers the opportunity of a longer day. The early train will reach Amsterdam at 12.11pm. Rotterdam plans to build an artful floating solar park. 3,770 solar panels shaped like a concentric wave, will represent the ‘ripples of change’ needed to bring about a renewable energy revolution. The panels will be a daytime feature; in the evening they will be enhanced by soft lighting. The designers want to create the semblance of breathing, strengthening the ripple effect. 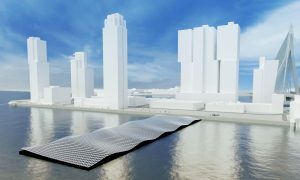 The expectation is that the floating solar park will be completed by the end of 2019 at the Rijnhaven or surrounding areas. Rotterdam may not be able to compete on history with its near neighbour, Amsterdam. Yet Holland’s second city is winning plaudits as one of Europe’s newest and liveliest short stay destinations. There are dramatic, diverting and exciting pieces of architecture, such as the world’s biggest, newest market hall, and a high and memorable walk over the water. Add to the list a transatlantic liner turned hotel, and a self-portrait of the painter whose Goldfinch inspired a literary hit. The city’s mediaeval core was flattened by German bombs in 1940. Since then it has been rebuilding itself with style and ambition. In the place of the lost tiny old churches and ancient, narrow ways, the rebuilt city offers sunken, pedestrianised shopping streets and striking high-rise buildings. I connected some of the 70 examples of imposing architecture, sculpture and dramatic city sites, armed with the tourist board’s Roaming Rotterdam booklet. Not everything in the centre was lost to the bombs. I found masterpieces such as the Laurenskerk. This church is the only survivor from the mediaeval city. And the Witte Huis, Europe’s earliest skyscraper (1898). The seven mile Roaming Rotterdam route takes a leisurely day on foot, or a few hours by bicycle – rent from Bikes at Central Station. Another self-guided itinerary is the 17 stop Rotterdam Art Route. Rotterdam is an easy city to navigate. At Central Station I linked into the comprehensive and user-friendly RET public transport system. Metro trains, trams, buses, and ferries buzzing around one of the world’s busiest ports – they are all equally clean, smart and efficient. Buy a travel card (three days, €14.00) at Central Station, touching in and out as you would with an Oyster card. Has there been an indoor market so huge, spacious and fabulously decorated since Istanbul’s Grand Bazaar? Markthal, opened in November 2014. I’m not sure there is anything like it outside the movies. High above the stalls are depictions of the produce of much of the world, which make this place unique. The ceiling is decorated with a clever and complex illustration, paying direct homage to the Sistine Chapel frescoes. The Horn of Plenty by Arno Coenen is based on film studios’ 3-D animation software. It combines market produce falling out of a sky of cauliflower clouds, alongside details from the city’s history. Across in the Bojimans Van Beuningen museum, art references literature. One self-portrait stood out to me. It was the not so well-known Carel Fabritius, the Dutch artist whose painting Goldfinch plays a big part in the novel of the same name. The Bojimans Van Beuningen museum, in Museumpark, is one of Holland’s many distinguished art collections. If the 1930s exterior suggests the stuffiness of just another stiff and formal collection, that is an illusion dispelled as early as the entrance hall. I placed my coat on a hanger and hoisted it high into the atrium for safe-keeping. An imaginative break from cloakroom convention. The gallery, too, goes beyond the normal staid presentation of old worksT. he curators provide refreshingly helpful commentaries on paintings and artists. There are some fine Rembrandts on display, alongside works by Picasso, Magritte, Hockney. Van Gogh and Dalí. I also called next door, at the restored, and very advanced in its day, 1930s house of the Sonneveld family, Huis Sonneveld. The city’s other major gallery is the newly-renovated Kunsthal. One of the city’s proud new structures is the half a mile long Erasmus Bridge. It opened in 1998 over the River Maas, uniting the city’s north and south. According to your point of view, the elegant white tower supporting the bridge on a lattice of cables could be a kneeling man, or a swan reaching for the sky, The are several ways across. You could take a tram, or cycle over. In the summer, it is worth walking across, in the dedicated pedestrian lane. Unless you are in a high building, this is the best overview of the city. First building over the water is Renzo Piano’s Toren op Zuid, built in 2001with a 6° lean to match the leaning Tower of Pisa. Just beyond it is the transformed docklands area. Here is the Luxor Theatre, the Netherlands Photo Museum, and the New York Hotel. And the SS Rotterdam. one of the last great transatlantic liners, built in 1959 for the crossing to New York. In 2008 the redundant ship was turned into a stationary hotel and meeting centre. She is now moored grandly on a quiet dockside in her namesake city. To sleep aboard a stationary ocean liner is a rare pleasure – perfect silence broken only by the occasional Rhine-going barge sliding by. And free of the risk of sea sickness. Frank Sinatra performed on this vessel. I suppose it is appropriate that he dominates the playlist on the piped music, although the repetiton was a touch tedious. They’ve kept as much as possible of the liner’s original decor and furniture. There are guided tours, and they are open to non-residents too, taking in the many opulent corners once open only to first-class passengers. My favourites are the dance floor, with an inset star motif made of many kinds of wood, and a ceramic relief in the Odyssey Room, telling Homer’s epic story of Odysseus. All the memories of the Holland-America Line’s voyaging coalesce in the splendid, restored to its golden age, New York Hotel. I recommend the restaurant.